After having attended an impressive cocktail demonstration at Zuma a few months ago (where we got to stir and shake our own tipples under the guidance of the restaurant’s very talented bartender! ), I was pretty excited to have the chance to go back to sample the food this time. Located on levels 5 and 6 of The Landmark smack in the middle of Central, Zuma is a contemporary Japanese restaurant that hits all the right notes for a date night out: great food, atmosphere and location. In the midst of all the narrow, cramped eateries saturating the Central / Soho area, Zuma is a breath of fresh air; the stunning 10,000 sq. foot space encompasses a main dining room, upstairs bar area and outdoor terrace with an open sushi counter and robata grill. Seating a total of 95 with bar stools, the upstairs lounge / bar is a sophisticated and sleek place to see and be seen, with a grand spiral staircase leading down to a spacious and warmly lit dining room complete with lofty ceilings, open kitchens and private dining areas. After being shown to a quiet corner table looking out on the outdoor patio, our first order of business was scoping out the drinks list. The restaurant is known for crafting exceptional cocktails, and some of their signatures are not to be missed. I opted for the Zumasunoki – blueberry-infused ciroc vodka shaken with creme violet, blueberry cordial, lemon juice and egg whites. My dining companion chose the signature Whiskey Sour – smoked infused whisky, yuzu juice, egg whites and a dash of plum bitters. The Zumasunoki came with a stunning presentation (almost too pretty to drink!) and had just the right balance of sweet fruit and acid to counteract. The Whiskey Sour was served tableside from a fun decanter and was both sweet and tangy with a seductive, but not overpowering hit of smoke. They don’t skimp on the liquor here either, which I definitely appreciated! With the laid back atmosphere and open view of the sushi and robata chefs at work, it was easy to pass the time before our first starters arrived: a mizuna salad with crispy jako, seaweed and poached, thinly sliced seabass with yuzu, truffle oil and salmon roe, and fried soft-shell crab. The mizuna salad was perhaps one of my favourite dishes of the night: the piquant, peppery greens (like a Japanese version of arugula) smothered in the egg yolk was creamy, crunchy and satisfying. The thinly sliced seabass was also delicious with the citrusy yuzu and hint of truffle. The soft-shell crab was well prepared, but as it presented nothing out of the ordinary, it came third in my book to the other two starters. We were then served a chef’s selection of sushi, including tuna, salmon, shrimp and yellowtail. While there was nothing to fault with the freshness of the fish, I thought the portion was a bit meager to justify paying $300 for 6 pieces. Next time, I’ll opt for just the sashimi instead, which was much more satisfying with thick, juicy cuts of fresh fish and sweet shrimp. We were intrigued by the “Zuma special sushi” section of the menu, and chose to try the seared tuna with mustard miso. The tuna was beautifully presented with a thin sear casing the outside and and a subtle but spicy kick from the mustard that amped up the flavour of the fish. There are a few more options in this section (wagyu tataki with caviar, hokkaido sea urchin and seasoned roe and seared salmon with sesame), which I would definitely recommend trying for something a little more out of the ordinary than the nigiri. 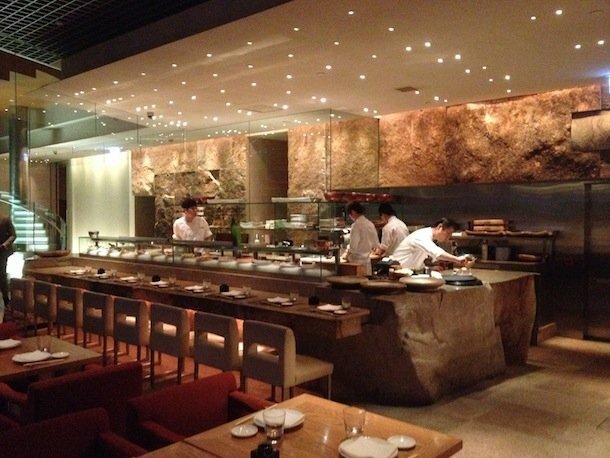 Zuma has a robust robatayaki (Japanese barbecue) section which is not to be missed. This is where the restaurant truly shines in my opinion (in addition to the fantastic cocktails, of course): the Australian spicy beef tenderloin was superbly cooked – a melt-in-your-mouth bite drenched in a decadent sesame, chili and sweet soy sauce. The grilled hokkaido scallops with plum butter and spicy cod roe were also incredible, although not as tender as the beef, which was the clear favourite of the night! From the vegetable selection, we tried the maitake mushrooms and sudachi – these were simply grilled and seasoned with a rich, natural umami flavour and a crunchy exterior giving away to a soft, chewy center. Simple yet satisfying! Although we were stuffed, we couldn’t resist ordering the fried langoustines to round out the savoury portion of the meal. Luckily, the portion was sampler-sized, and we thoroughly enjoyed the crispy fried sweet langoustines dipped in a tangy onion and chili sauce. I rarely ever end a meal without something sweet, and Zuma’s green tea banana cake definitely hit the spot. The cake was soaked through in a decadent caramel sauce and the icy and light coconut cream was a perfect accompaniment to cut through the richness of the cake. I also appreciated the creative banana “flower” adornment to top off the visual! Overall, Zuma is a solid choice for a date night or even more so a business dinner if you’re looking to impress – the grand atmosphere, varied menu and lengthy sake and cocktail list all lend themselves to a very happy client at the end of the night (as we witnessed with several tables nearby!) With such a spacious dining room, service can be slightly inattentive at times, but it’s nothing a few waves of the hand can’t fix, and overall we enjoyed our food and drinks so much that we were very content to sit back and roll with the punches.